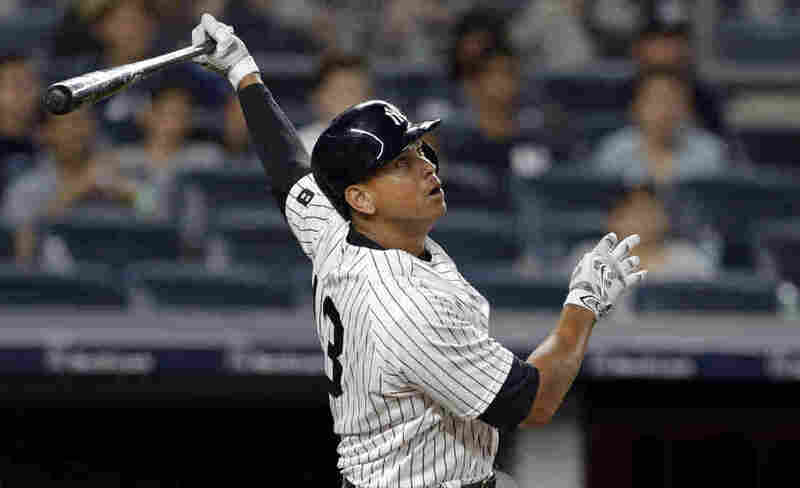 Yankees Release Alex Rodriguez, Announcing His Last Game Is Friday : The Two-Way The Yankees have announced they are releasing the controversial slugger. The club says Rodriguez will serve as a "special adviser and instructor" for the team through 2017. New York Yankees designated hitter Alex Rodriguez at bat against the Boston Red Sox during a baseball game in July in New York. The Yankees have announced they are releasing slugger Alex Rodriguez. The club says Rodriguez will play his final major league game on Friday, then serve as a "special adviser and instructor" for the team through 2017. Rodriguez, 41, had previously said he planned to retire after the 2017 season, as we reported. He suffered a hamstring injury in May and has since spent time on the bench. "No athlete ever ends his career, or her career, the way you want to," he told reporters while visibly emotional at a news conference. "We all want to keep playing forever, but it doesn't work that way. Accepting the end gracefully is part of being a professional athlete. Saying goodbye may be the hardest part of the job, but that's what I'm doing today." He is just four career home runs shy of the magic number 700 — only topped on the all-time home run list by Babe Ruth, Hank Aaron and Barry Bonds. The announcement Sunday was "the Yankee's decision, and I'm at peace with it," Rodriguez said. "I thought I would have a strong finish and a strong year next year, but again, that wasn't in the cards." "In his 20 seasons in the league so far, Rodriguez has been named the American League MVP three times, has been nominated to the A.L. all-star team 14 times, and was part of the Yankees' World Series winning team in 2009. "But Rodriguez's career will be forever shadowed by using performance-enhancing drugs, for which he was suspended for the entire 2014 season. Major League Baseball said he used numerous performance-enhancing substances and then tried to "cover-up" his use by obstructing baseball's investigation. At the time of the suspension, Rodriguez maintained he did not use performance-enhancing substances, though when he returned to baseball before the 2015 season, he released a handwritten letter to fans that said, 'I take full responsibility for the mistakes that led to my suspension for the 2014 season.'" Rodriguez said he asked for the opportunity to play one more game. That will be Friday's home game against the Tampa Bay Rays, and Rodriguez says the club's management has assured him he'll "get a few at-bats."